Rear sight pusher will work with 90 degree and 30 degree rear sight profiles. Rear sight pusher can remove, install, or adjust the rear sights in either direction. Base platform is adjustable for height, to get your slide and rear sights at the proper height for the rear sight pusher. • Universal Pistol Rear Sight Tool designed for: Removal, Installation, and Adjusting windage of dovetailed rear sights for most Semi-Auto Pistol slides. Universal Pistol Rear Sight Tool. • The Universal Pistol Rear Sight Tool works with many types of semi-auto slides: full, compact, sub compact, and pocket sized semi-auto pistols. Universal Pistol Rear Sight Tool designed for: Removal, Installation, and Adjusting windage of dovetailed rear sights for most Semi-Auto Pistol slides. The Universal Pistol Rear Sight Tool works with many types of semi-auto slides: full, compact, sub compact, and pocket sized semi-auto pistols. FREE Priority Mail Shipping Upgrade. Lifetime Warranty! Model Number: VTUPRS. This VISM (a division of NcSTAR) Universal Pistol Rear Sight Tool is designed for removal, installation, and adjusting windage of dovetail rear pistol sights for most semi-auto pistol slides. 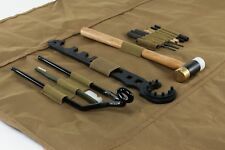 Gunsmithing Tool Kit with Tan Roll-Up Cleaning Mat. TARW2 - Armorer's wrench with various types of barrel nut, castle nut, muzzle brake, buffer tube wrenches and more! Tactical Gear Tactical Gear Accessories First Responders Gear Tactical Clothing Firearm Optics Firearm Products Pistol & Rifle Cases Airsoft Guns Specials. Armorer's Barrel Wrench. Combo tool with plenty of features to work, upgrade your Rifle. NcSTAR Patented Design: US Pat. # D598,723. Tactical Gear Tactical Gear Accessories First Responders Gear Tactical Clothing Firearm Optics Firearm Products Pistol & Rifle Cases Airsoft Guns Specials. 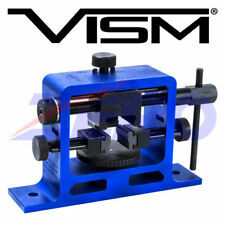 NcSTAR VTUPRS Semi Auto Pistol Rear Sight Removal Installation Pusher Tool. Model: VTUPRS. Manufacture: NcSTAR. We are a nationwide provider of airsoft guns, accessories, and gear to airsoft enthusiasts all over the country. Hardened steel 3/32" or 2.5mm punch tool for all Glock® pistols. Pointed cap can be screwed onto the pocket clip cap to prevent losing it when the tool is in use. We would be happy to assist you. The modular Vise block can be used in several ways for many different maintenance tasks. Save Money. We are always here to help given a chance. Once the item is received back to our warehouse a technician will verify if defective. NcSTAR® Essential Gunsmith Tool Kit includes everything you need. even safety glasses! Whether you're a beginner or a professional, the NcSTAR® Essential Gun Smith Tool Kit has everything you need to maintain and tinker with your firearms. Simply insert the hook from the small lever into the floor plate, rest the MagPopper body against the front of the magazine body. With one hand grasp the MagPopper and the magazine body and gently squeze. Remove, install and adjust the rear sight on basically any semi-auto pistol with NcStar's new VTUPRS heavy duty rear sight tool. Perfect for full size, compact, subcompact and pocket size pistols. Mount or clamp it to your workstation and quickly do what you need to. Neither “NcSTAR Inc. & VISM” nor this site are affiliated in any manner with, or otherwise endorsed by, GLOCK, Inc. or GLOCK Ges.mbH. NCStar G5 Pocket Tool for Glock Magazines. Hardened steel 3/32" or 2.5mm punch tool for all Glock® pistols. •. 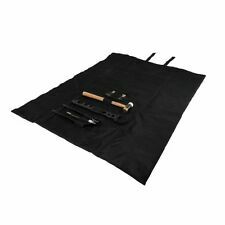 223/5.56 Gunsmithing Tool Kit with Tan Roll-Up Cleaning Mat. • TARW2 -. 223/5.56 Armorer's wrench with various types of barrel nut, castle nut, muzzle brake, buffer tube wrenches and more! • 3/32" steel punch - Bolt Catch roll pin tool. NcSTAR TARW 5.56/. 223 Steel Combo Rifle Armorer Wrench Multi Tool. Armorer Wrench Multi Tool is a heavy duty, multi purpose tool for early every type of rifle modification. Armorer's Barrel Wrench. •. 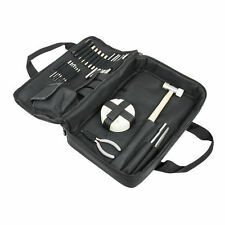 223/5.56 Gunsmithing Tool Kit with Black Roll-Up Cleaning Mat. • TARW2 -. 223/5.56 Armorer's wrench with various types of barrel nut, castle nut, muzzle brake, buffer tube wrenches and more! • 3/32" steel punch - Bolt Catch roll pin tool. Neither “NcSTAR Inc. & VISM” nor this site are affiliated in any manner with, or otherwise endorsed by, GLOCK, Inc. or GLOCK Ges.mbH. NCStar Disassembly & Front Sight Tool for Glock Magazines. 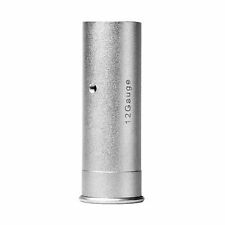 Hardened steel 3/32" or 2.5mm punch tool for all Glock® pistols. NEW NcStar TARW2 Armorer's Wrench. Multi Tool. A2 Buffer tube wrench. Bonus tools: 1911 Barrel Bushing wrench and a Tactical Bottle Opener. 1/2" & 3/8" Drive sockets for your Torque wrenches. NcSTAR TARW 5.56/. 223 Steel Combo Rifle Armorer Wrench Multi Tool WITH. Armorer Wrench Multi Tool is a heavy duty, multi purpose tool for early every type of rifle modification. 1 x single point Sling. 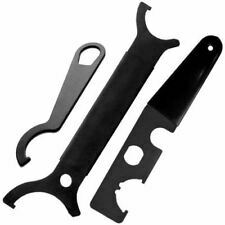 NcStar MagPopper Magazine Disassembly Tool Bottle Opener A Hole On The Main Body For Mounting Onto Key Rings A ¼" Hex Hole For Holding ¼" Screwdriver Bits. Compact Design For Convenient Storage. Steel Construction. Color: Blue Works With Most Factory Glock Flat Floorplates. Works With 10 Round, Standard Capacity, And High Capacity Glock Magazines..
NcSTAR has KeyMod free float handguards made specifically for the Smith & Wesson M&P 15-22. 22LR. Barrel Nut Wrench for the Smith & Wesson M&P 15-22. 22LR. Tool has machined teeth to interface with the Smith & Wesson M&P 15-22. 22LR factory barrel nut. NcStar Disassembly & Front Sight Tool for Glock Features: - Tactical tool designed in a pen configuration with a steel disassembly and front sight tool for Glock pistols - Anodized blue aluminum pen tool with two threaded caps that thread into the center body, with a black steel pocket clip - Hardened steel 3/32" or 2.5mm punch tool for all Glock pistols. Model: TARW. The NcStar 5.56/.223 Armorer's Barrel Wrench is a combo tool with plenty of features to work with. It features a barrel wrench for a GI Barrel Nut, A1 & A2 flash suppressor wrenches, flat blade screw driver and is compatible with 1/2" drive ratchet. NCStar TARW2 Armorers Wrench. • NcSTAR Patented Design: US Pat. # D703,502. • Barrel Wrench for GI Barrel Nut, Free-Float Barrel Nuts with GI spacing, DD Barrel Nuts, and YHM ( 1¾") Spanner wrench. • 1/4" Hex Bit Drive Socket, 1911 Barrel Bushing Wrench, and a Tactical Bottle Opener. • You can remove/install. 223 5.56 castle nuts with ease with this. 223 5.56 wrench. • The other end of the wrench is for installing/removing A2 Rifle buffer tubes (¾")". • Large heavy duty cross section makes it easier on the hands to work on your. 223 5.56 lower receiver. Handguard Removal Gunsmithing Tool. Works with Rifle, Carbine, & Mid-Length Handguards. We are always here to help given a chance. Be at least 18 years of age or older. Weight: 5.9 oz. • Pro Series Barrel Wrench - heavy duty purpose built barrel wrench. • You can remove/install GI barrel nuts with ease with this wrench. Makes for assembling/installing barrels and free float handguards a super easy task. The modular Vise block can be used in several ways for many different maintenance tasks. 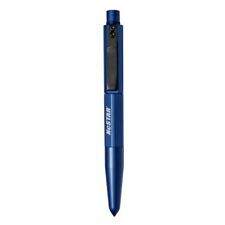 Constructed with blue anodized Aluminum. We would be happy to assist you. Neither “NcSTAR Inc. & VISM” nor this site are affiliated in any manner with, or otherwise endorsed by, GLOCK, Inc. or GLOCK Ges.mbH. NCStar MagPopper for Glock Magazines. Works with most factory Glock® flat floorplates. Model: TGSARKT. 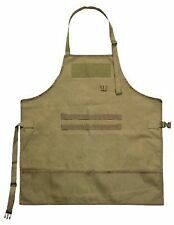 - 5.56/.223 Gunsmithing Tool Kit with Tan Roll-Up Cleaning Mat. The NcSTAR 5.56/.223 Gun Smithing Tool Kit is perfect for keeping your favorite rifle up and running. Manufacture: NcSTAR. 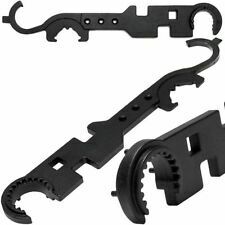 NcStar Universal Pistol Rear Sight Tool. 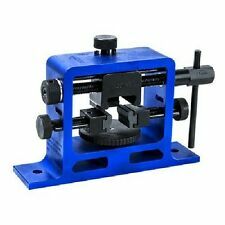 - Universal Pistol Rear Sight Tool designed for: Removal, Installation, and Adjusting windage of dovetailed rear sights for most Semi-Auto Pistol slides. - Base platform is adjustable for height, to get your slide and rear sights at the proper height for the rear sight pusher. Manufacture: NcSTAR. Model: TAR. This 5.56/.223 Rifle Multi Tool is one of the most convenient tools due to it being compact. It includes a Nylon case with Belt Lip and is constructed of stainless steel. NcStar TGSETK Essential Gun Smithing Tool Kit. Gunsmith Bench Block - 4" Dia. Roll Pin Drift Punch - 3/32", 3/16", 7/32", 1/4". Drift Punch - 3/32", 1/8", 3/16". Brass Drift Punch - 1/8", 5/32", 7/32", 1/4", 5/16". Finally an Armorers Wrench with everything that you need. This unique tool combines all of the necessary tools to eliminate the need of owning multiple wrench types. Use it for all of your tactical carbine rifles and all of their variants. Model: TGSETK. This NcSTAR gunsmith tool kit is designed to fulfill all your gunsmithing needs! NcSTAR specializes in accessories to make your rifle and/or pistol perform to the best of its ability. Model: TARW2. The NcStar 5.56/.223 Armorer's Barrel Wrench is a combo tool with plenty of features to work with. It features a barrel wrench for a GI Barrel Nut, A1 & A2 flash suppressor wrenches, flat blade screw driver and is compatible with 1/2" drive ratchet. 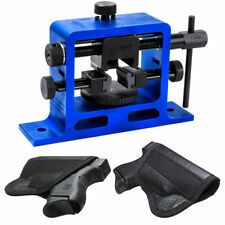 NcSTAR Universal Pistol Rear Sight Tool,Blue VTUPRS. Model Number:VTUPRS. 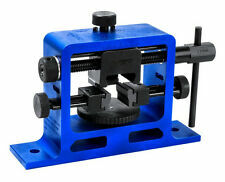 NcSTAR VTUPRS: Universal Pistol Rear Sight Tool, Blue. Features of NcSTAR Universal Pistol Rear Sight Tool NcSTAR Universal Pistol Rear Sight Tool. Neither “NcSTAR Inc. & VISM” nor this site are affiliated in any manner with, or otherwise endorsed by, GLOCK, Inc. or GLOCK Ges.mbH. G5 Pocket Tool for GLOCK® Pistols. Hardened steel 3/32" or 2.5mm punch tool for all Glock® pistols. Duck Commander Gun Tool New, NcStar A/K/SKS Front Sight Adjustable Tool Etc.